Jack’s Motley Assortment of AutoHotkey Tips contains a wide variety of techniques for both beginning and more advanced users (e.g. Regular Expressions (RegEx) and Web scraping). Many of the techniques in this book come from currently unpublished articles. I’ve done my best to bring a semblance of order to the chapters and group them into sections based upon common themes. Some appear in order based upon application or type of AutoHotkey techniques (e.g. Clipboard usage, window manipulation) while others explore specific commands (e.g. the WinSet command). If you don’t know which AutoHotkey e-books to get or which reading format is best for you, you can get all the books in all three formats in one Mega Library Bundle. This bundle includes each of Jack’s ten AutoHotkey books in all three digital formats: EPUB format (iPad, Nook, Kobo, etc. ), the MOBI format (Amazon Kindle) and the Adobe PDF format for printing on letter size paper and putting in a notebook for easy review and note taking when away from your computer or other reading device. Tip: When you buy one of Jack’s AutoHotkey Libraries, you get Library Membership automatically. As Jack updates the books in your library for upcoming changes in AutoHotkey, you get them all free! Plus, you get a substantial discount on any new AutoHotkey books released. See Jack’s AutoHotkey E-Book Library Membership for more details. Special Deal for Old ComputorEdge E-Books AutoHotkey Book Customers! These books act as a great resource for learning or as references for the free AutoHotkey software—absolutely the best free Windows utility software ever! You can create powerful tools for Windows XP, Windows Vista, Windows 7, Windows 8, and Windows 10. If you’re just starting out, but don’t want to commit to the entire library, this bundle gives you the boost you need. Get these beginning books in all three formats in one Starter Deal! This bundle includes each of Jack’s beginning AutoHotkey books in all three digital formats: EPUB format (iPad, Nook, Kobo, etc. ), the MOBI format (Amazon Kindle) and the Adobe PDF format for printing on letter size paper and putting in a notebook for easy review and notetaking when away from your computer or other reading device. These are great books for learning how to use the free AutoHotkey software—absolutely the best free Windows utility software ever! Create power tools for Windows XP, Windows Vista, Windows 7, Windows 8, and Windows 10. While included in the AutoHotkey Mega Library Bundle, you can add on Jack’s Motley Assortment of AutoHotkeyTips three-format bundle at a greatly reduced price to either the Starter Bundle or Intermediate Bundle by adding the Motley Tips three-format bundle to your shopping cart (along with your selected bundle) and entering the discount code “MOTLEY” at check out. Don’t Know Which AutoHotkey E-Book to Get or Which E-Book Format is Best for You? Get Jack’s Intermediate Level Books in All Three Formats in One Mega-Deal! 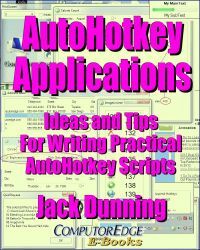 This bundle includes each of Jack’s three AutoHotkey books in all three digital formats, plus the AutoHotkey Tricks book with indexes from all books: EPUB format (iPad, Nook, Kobo, etc. ), the MOBI format (Amazon Kindle) and the Adobe PDF format for printing on letter size paper and putting in a notebook for easy review and notetaking when away from your computer or other reading device. 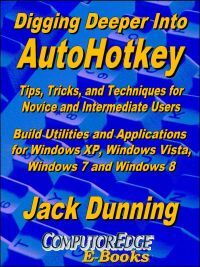 Great Books for Learning (or as References for) the Free AutoHotkey Software — Absolutely the Best Free Windows Utility Software Ever! Create Power Tools for Windows XP, Windows Vista, Windows 7, Windows 8, and Windows 10. If you want the combined Starter and Intermediate AutoHotkey Bundles at an even better price, you can get all those books in all three formats in the AutoHotkey Essentials Library Bundle. This bundle includes the AutoHotkey books in the first two bundles in all three digital formats: EPUB format (iPad, Nook, Kobo, etc. ), the MOBI format (Amazon Kindle) and the Adobe PDF format for printing on letter size paper and putting in a notebook for easy review and notetaking when away from your computer or other reading device. These books act as a great resource for learning or as references for the free AutoHotkey software—absolutely the best free Windows utility software ever! You can create power tools for Windows XP, Windows Vista, Windows 7, Windows 8, and Windows 10. While included in the AutoHotkey Mega Library Bundle, you can add on Jack’s Motley Assortment of AutoHotkeyTips three-format bundle at a greatly reduced price to the AutoHotkey Essentials Library Bundle by adding the Motley Tips three-format bundle to your shopping cart (along with your selected bundle) and entering the discount code “MOTLEY” at check out—or just purchase the Mega Library Bundle at for the same total price. If you don’t know which AutoHotkey e-books to get or which reading format is best for you, you can get all the books in all three formats in one Mega Library Bundle. This bundle includes each of Jack’s ten AutoHotkey books in all three digital formats: EPUB format (iPad, Nook, Kobo, etc. ), the MOBI format (Amazon Kindle) and the Adobe PDF format for printing on letter size paper and putting in a notebook for easy review and notetaking when away from your computer or other reading device. For more details about A Beginner’s Guide to AutoHotkey (Table of Contents and the entire book index), click here! Building Power Tools for Windows XP, Windows Vista, Windows 7, Windows 8 and Windows 10, AutoHotkey is the most powerful, flexible, free Windows utility software available. Anyone can instantly add more of the functions that they want in all of their Windows programs, whether installed on their computer or while working on the Web. AutoHotkey has a universality not found in any other Windows utility—free or paid. Originally based on the series of articles in ComputorEdge, Jack takes you through his learning experience as he explores writing simple AutoHotkey scripts for adding repetitive text in any program or on the Web, running programs with special hotkeys or gadgets, manipulating the size and screen location of windows, making any window always-on-top, copying and moving files, and much more. Each chapter builds on the previous chapters. For an EPUB (iPad, NOOK, etc.) version of A Beginner’s Guide to AutoHotkey click here! For a PDF version for printing on letter size paper for inclusion in a standard notebook of A Beginner’s Guide to AutoHotkey click here! Jack’s second AutoHotkey book, Digging Deeper Into AutoHotkey (preferred, EPUB format for iPad, Android, and computers; MOBI for Amazon Kindle; and PDF for printing) is comprised of updated, reorganized and indexed columns from ComputorEdge is now available. Since the columns were not all written in a linear fashion, the book has been reorganized and broken up into parts by topic. The book is not for the complete beginner since it builds on the information in A Beginner’s Guide to AutoHotkey. For more details about Digging Deeper into AutoHotkey (Table of Contents and the entire book index), click here! For more details about AutoHotkey Applications (Table of Contents and the entire book index), click here! As a convenience for people who don’t want to dig through the Web for individual tips, but would like to learn some cool AutoHotkey Hotstring tricks, the e-book Beginning AutoHotkey Hotstrings is now available on the ComputorEdge E-Books site and through Amazon. If e-books are not your thing, then it might be worth your time to peruse some of the blogs included in this book and linked at “Beginning AutoHotkey Hotstring Techniques” found under the “AutoHotkey Topics and Series” tab in the top menu bar. They just might inspire your next AutoHotkey script. Beginning Hotstrings explores the potential of the basic AutoHotkey Hotstring option and how they can aid anyone who uses word processors, text editors, or Web input fields on Windows computers. It’s surprising how this one small area of AutoHotkey can add power to your computer through Hotstring menus and the enigmatic Input command. For more details about Beginning AutoHotkey Hotstrings (Table of Contents and the entire book index), click here! The book starts at a beginning level (Chapter One), but it quickly builds upon that basic Hotkey structure to introduce more advanced techniques—including detailed discussions of the unique Hotkey command. “Writing this book turned into a voyage of discovery. I merely followed where the AutoHotkey commands and features led me.” The book is now available at the ComputorEdge E-Books site (in three formats: EPUB, MOBI for Kindle, and PDF for viewing and printing) and through Amazon. I wrote Beginning Tips for Writing AutoHotkey Script not as a tutorial, but as a guide to understanding how AutoHotkey processes scripts and how you can better design applications. For many new AutoHotkey users, the actions AutoHotkey takes when loading a script appear enigmatic causing unpredictable results. While initially many features may not seem to add up, AutoHotkey reads a script in a way that makes total sense—once you comprehend it. You’ll find understanding how AutoHotkey gets things done critical to writing and debugging robust scripts. 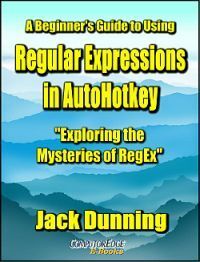 For more details about Regular Expressions in AutoHotkey (Table of Contents and the entire book index), click here!